Betty Louise Arledge, 92, of Chillicothe passed from this life to join the Lord, on Saturday, June 16, 2018 in Adena Regional Medical Center. She was born August 20, 1925 in Chillicothe, the daughter of Alfred and Laura (Sollars) Walter. On January 11, 1947 she married Leslie “Bud” Arledge and together they celebrated their 71st wedding anniversary in January, 2018. 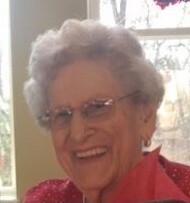 Surviving is her husband, Leslie “Bud” Arledge, Chillicothe; her son, Barry Arledge, Waverly; her daughter, Janna (Terry) Lansing, Worthington; grandchildren, Dustin Lansing, Drew Lansing, Andrea Bumgardner, Larry Tennant, Jr. and Laura Tennant; 11 great-grandchildren; 3 great-great-grandchildren; a sister, Judy (Ivan) Purdum, Chillicothe; nieces, Lori Purdum, Myrtle Beach, SC and Nicole Sleek, Wooster, OH; 3 great-nieces and a great-nephew. She was preceded in death by her parents, a daughter, Debbie Tennant and a grandson, Brian Arledge. Betty was an active member of Trinity United Methodist Church. She served many years as a poll worker for Ross County and along with her husband, were long-time volunteers at Adena Regional Medical Center. Betty was an avid bowler and square dancer, an excellent seamstress and enjoyed ceramics. She was a loving and devoted wife, mother, grandmother and great-grandmother and will be greatly missed. Funeral services will be held at 1:00 pm on Wednesday, June 20, 2018 in the FAWCETT OLIVER GLASS AND PALMER FUNERAL HOME with Pastor Jim Wade officiating. Burial will follow in Greenlawn Cemetery. The family will receive friends at the funeral home from 11:00 am until the hour of service on Wednesday. The Fawcett Oliver Glass and Palmer are honored to serve the family.